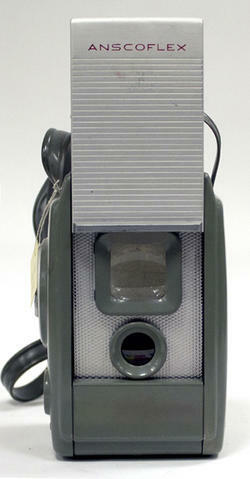 Item is an all-metal camera designed by Raymond Loewy for 6 x 6 cm (2.36" x 2.36") exposures on 620 film. Designed to mimic the look of a twin lens camera, the topmost "lens" is in fact a brilliant viewfinder, it is a simple box camera design with a two element Meniscus F11 lens and fixed 1/60th shutter speed. The front panel slides up to reveal the lens and viewfinder.